Oberon Design's bench crafted journals are made to order in Santa Rosa, California. These refillable journals are constructed from premium, US bullhide and finished with a decorative pewter button hand cast at Oberon Design. 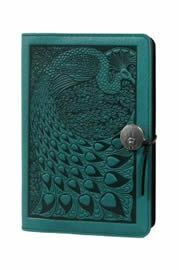 Oberon journals are available in a wide variety of designs including images inspired by the natural world, Celtic knots, historic and mythic designs. Available in three sizes, our leather cover slides over a hard bound blank book insert with acid free, heavy bond paper pages. The large and small journals include a lined template sheet to facilitate writing.